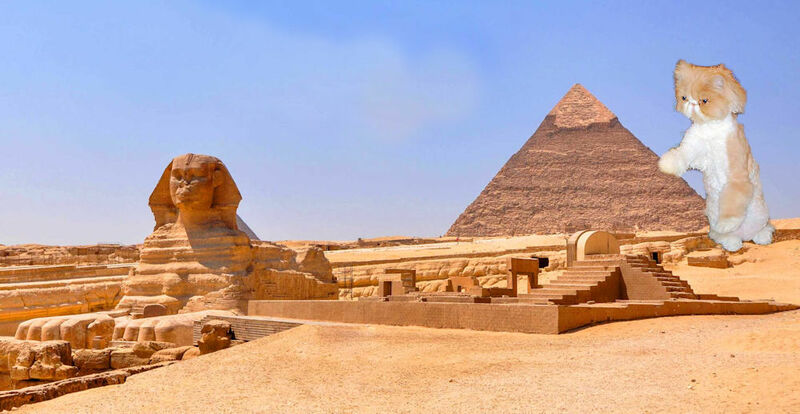 Over 4,000 years ago, the Egyptians domesticated cats. Nowadays, people have a taste for all things exotic and are working to undo the domesticated cat with the introduction of "half-wild" cats. Yes, this is just my opinion. These breeders are breeding for a designer look and taken to breeding house cats with medium-sized, wild cats to create new animals that act as if they were still in the grasslands of Africa. According to The International Cat Association (TICA), the first effort to breed a wild cat with a domestic cat was in 1963 when Jean Mill "invented" the Bengal by crossing a house cat with the Asian leopard cat to create an animal (according to Ms. Mill) that had "the loving nature of a favored fireside tabby and the striking look associated with leopards, ocelots, and jaguars". The Cat Fanciers' Association (CFA) just recently recognize the Bengal as a legitimate breed. 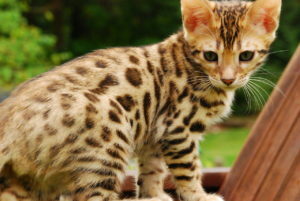 A Bengal cat can now be registered and shown in CFA cat shows. 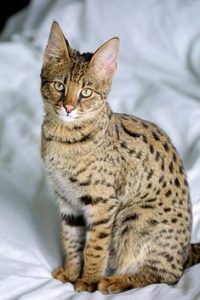 The first known Savannah was born in April 1986, when a female domestic cat gave birth to a kitten sired by a Serval (an African wildcat that weighs up to 50 pounds and eats anything from birds and rabbits to deer and gazelles). TICA accepted the Savannah breed for registration in 2001, and in 2012, TICA allowed the breed to be accepted for Champion status. Please note: CFA does NOT register nor allow the Savannah to be shown at CFA shows. It is generally agreed that the founder of the Savannah breed is Joyce Sroufe, A1 Savannah Cattery. This is not only the world's first Savannah cattery, but also the one responsible for breeding the largest domesticated house cat documented by Guinness Book of World Records. Savannahs are classified by the percentage of Serval genes in them: "F1 Savannahs" are at least 53% Serval, and a top show/breeding quality female cat can cost up to $35,000. On the opposite end are the "SBT Savannah" kittens which are "pure" Savannahs that only have Savannahs as parents for at least three generations; top show quality/breedable kittens can cost up to $9,000. These prices are fairly typical with any designer breed. Because we live in a nation where people like to feel that they own something "different", despite the high price tag for these half-wild kittens, they continue to increase in popularity. A recent article in The New Yorker states that the proliferation of domestic/wild cats is controversial beyond the cost. In fact, in New York (among other places) it is illegal to own a Savannah, unless it is at least five generations removed from the wild cat. Despite the controversy, catteries continue to pump out these new felines and ship them around the world. A quote from one of these "breeders": "I am an artist!.... And I have designed and built a cat." Shameful in my opinion. "Allowing the private possession of wild cat/ domestic cat hybrids is like strapping a nuclear war head to the feral cat problem." ... "In a nutshell, it is an irresponsible thing to do and there is no redeeming reason to cross breed these cats nor to support those who do by buying one. It almost never works out for the individual cat and in the rare case that it does, the number of animals that had to suffer in order for this one rare cat to exist is staggering." "Even after 4 or 5 generations, that wild personality is a dominant trait and while it is marketed as being just like having a tiny tiger in your home, most people don't know what that really means. As someone who is not trying to sell you a $2,000.00 kitten that you will one day take to the dog pound out of frustration, let me tell you what it is like to live with a hybrid." "We have had a bunch of them that were former pets. We have had to turn away many, many more because most of them cannot run free outside and have to have the same cages as bobcats and cougars. They all spray. Male or female, neutered or not, first generation or fifth generation; I have never met one that didn't spray urine all over everything in their path." "They bite. Even in play, even if they love you, they bite and I have scars all over my hands to prove that their love nips will leave you bleeding. They want to eat your other pets and they don't care if it's a German Shepherd, they are going to be constantly looking for a way to take the dog down. That is why many of them can't run free on Easy Street. They pick fights with 500 pound tigers. I have even received reports from Florida's Game and Fish Commission of them stalking little old ladies and I have been called in to trap and remove them. This discarded pet now lives on Easy Street, but most are not this lucky." Designer breeds or hybrids do not serve any purpose other than to assuage one's ego which is not a good enough reason to play with fire. Visit Big Cat Rescue for more information on Hybrids and Big Cat Rescue.